We’re living in a highly charged political age, but perhaps there is no single issue (unless you count the President as an “issue”) more polarizing in the country than one that should have been relegated to the history books half a century ago: black and white relations. It’s a peculiarly American problem fostered by our specific history with black people; you don’t hear about African-Spanish or African-English people but rather Spanish or English people who happen to be black. Here in the US we need a hyphenate. Another polarizing issue is that of LGBT rights and relationships. In This Bitter Earth, playwright Harrison David Rivers has created a complex plot that touches on both of these, playing the “double minority” for all it is worth. 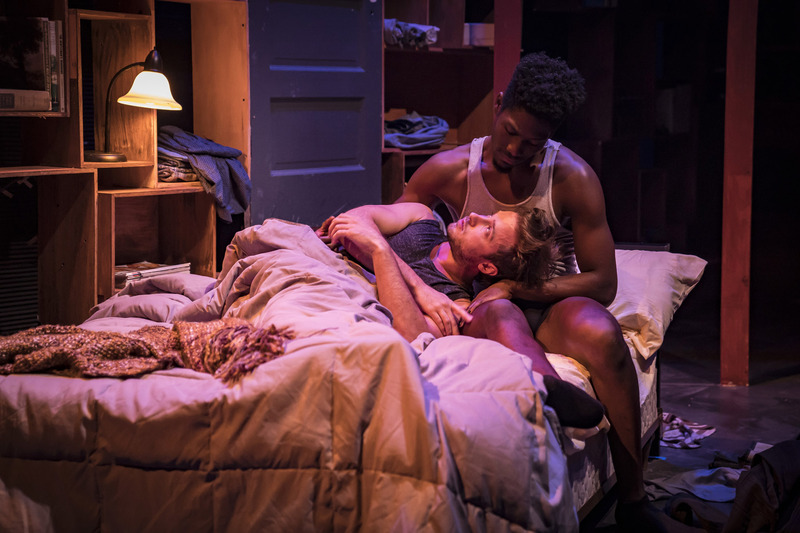 The result is a beautiful, painful, tender play about a gay couple, one black and one white, who find themselves both in love and at odds because of politics. The story spans the years 2012-2015, from right at the formation of the Black Lives Matter movement in the wake of Ferguson through several years of protests, police murders, and the massacre at Charleston. Neil (Daniel Desmarais), the white half of the couple, a wealthy young man of privilege, believes strongly in the cause even when he’s the only white person in the crowd. (He does acknowledge that he might be assuaging “white guilt.”) Jesse (Sheldon Brown) is a grad student who is completely apolitical, and Neil just can’t figure out why his lover isn’t critically angry over the fact that young men of color—like him—are being killed all across the country, but Jesse is more inner-directed; he just wants to finish his thesis. Rivers’ Moebius strip of a script takes all of this out of sequence, doubling back on itself and replaying certain moments, and taking us on a very private journey within the larger societal ones Neil is fighting. Director Mikael Burke keeps the show balanced with quick-paced scenes and slow, poignant moments, and uses Joe Schermoly’s eccentric set perfectly. Burke also nurses two compelling performances from his gifted actors. Desmarais is very strong in the role of the young activist. His fervor is palpable, as is his nonchalance toward both his upper-class upbringing and his gayness: he is a person who believes strongly that everyone should be free and that all discrimination (race, sexuality, class) is wrong and is willing to put himself on the front lines to change things. Brown, playing the young black man who submerges his own anger about the world beneath his focus on his writing, is the character from whose point of view we mostly see this journey. It is Jesse’s memories that play out on the stage, a fact highlighted by the downstage left placement of his writing desk (actually in front of the artificial proscenium). Brown is amazing: with his character going through some major emotional swings, he jumps in and out of powerful scenes and through loving ones and comic ones and back. It’s even fascinating just to watch him trying to work through his thesis, and when he reveals a part of it to Neil he is irresistible. John Kelly’s lighting design is stellar here. In addition to highlighting parts of the stage and times of day, he has arranged to light up many of the small sections of cabinet that form the walls, and he uses these lights to create many different looks and feelings. Similarly, Eric Backus composed original music to go along with a perfect sound design. And props (pun intended) must also go to properties designer Emma Cullimore, who fills all of those cabinets with wonderfully eclectic artifacts of young male life. This Bitter Earth couldn’t be more timely, and that is unfortunate. As I said, in a better world this country would have been long over its issues. That we are not, however, and that we now have an administration that actively fans the fires of hatred and discrimination, makes a show like this, which is one of the year’s best, a must-see. It’s not perfect—there is an infidelity subplot thrown in apparently because it is de rigueur to include such subplots in all gay narratives—but it gets so much right that it’s hard to quibble. It’s a brilliant beginning to About Face Theatre’s 23rd season. This Bitter Earth is an About Face Theatre production now playing at Theatre WIt, 1229 W. Belmont Ave, Chicago, through Dec 8. Check the website for specific dates, times, and tickets. Find more information about current plays in our front page recs and at theatreinchicago.com.